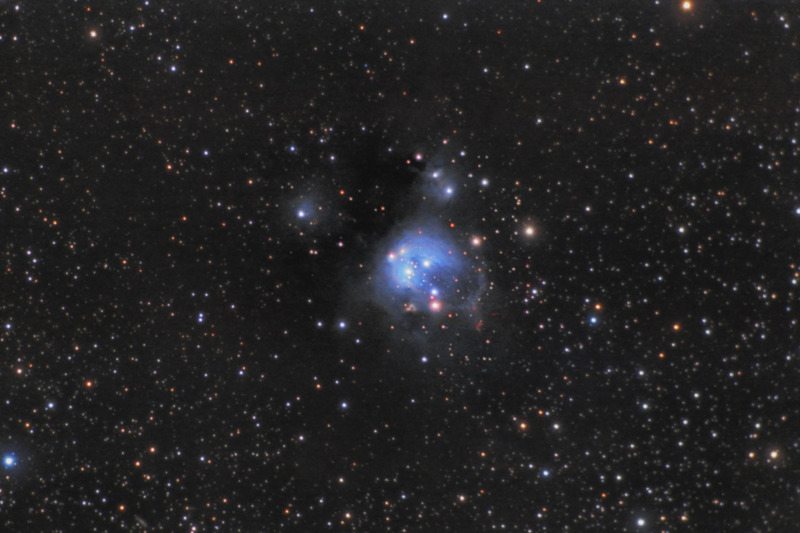 NGC 7129 is a stellar nursery surrounded by a blue reflection nebula. The brightest stars in this very young cluster are hot, blue stars. The surrounding dust reflects this blue light towards us. Also contained within the nebula are several deep red crescent shaped "Herbig-Haro" objects. These red regions are where red hydrogen gas has been compressed by shock waves originating from the young stars. Photographically, NGC 7129 is about 7 arc minutes in diameter, and has a very low surface brightness. As such, it makes for a challenging object to image. Notes While I'm generally fairly happy with this image, I think it could have benefited from some more imaging time. I had to push the processing fairly hard, and I couldn't bring out as much separation between the faint parts of the nebula and the surrounding dark nebula. Due to the subtleness of the nebula, I found this to be a very difficult image to process. This image won 1st place in Cloudy Night's September 2012 DSLR Challenge contest.